Declaration of Independence signer, Thomas Nelson autograph letter signed, "Thos Nelson Jr." as Governor of Virginia, thus Governor of the state where the Yorktown Surrender and the last fighting of the Revolutionary War happened. 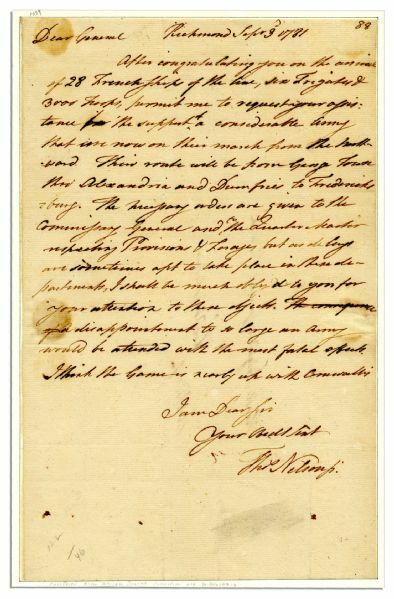 In this autograph letter signed, with an additional free frank signed, Nelson asks Brigadier General George Weedon to thwart disaster by taking care of supplying provisions for Washington's Yorktown-bound army. 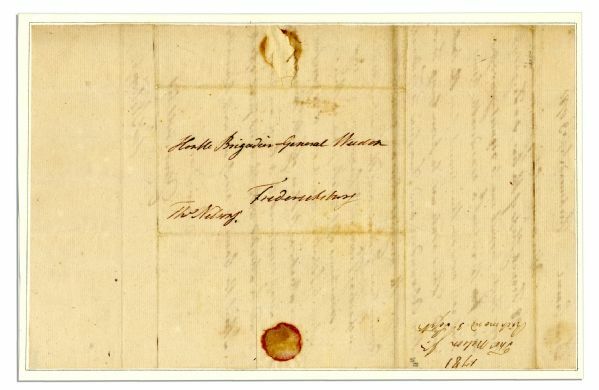 Nelson personally fought in the Seige of Yorktown. 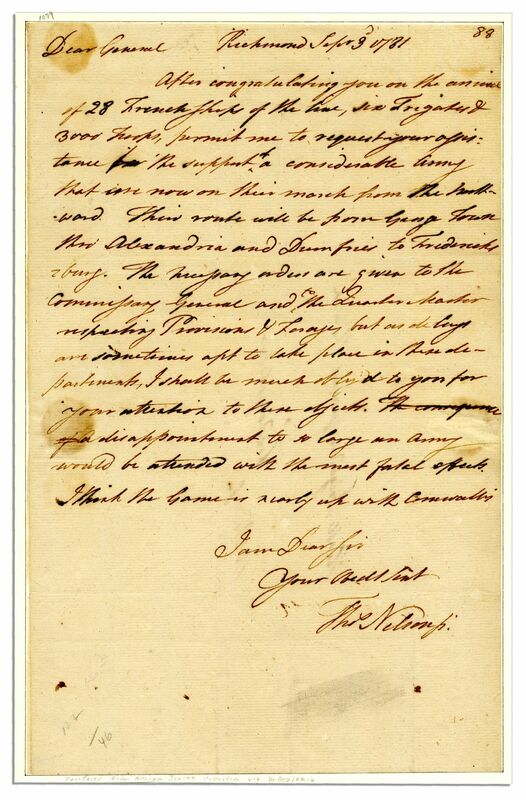 Datelined Richmond, Virginia, 3 September 1781, letter reads: "…After congratulating you on the arrival of 28 French ships of the line, six frigates & 3000 troops, permit me to request your assistance for the support of a considerable army that are now on their march from the northward…Disappointment to so large an army would be attended with the most fatal effects. I think the game is nearly up with Cornwallis…" Large folio document runs one page and measures 8" x 12.5". Toning and light staining, with signed address leaf mounted to verso, else near fine. Published in Magazine of History, August 1910, pages 125-6. Provenance: Henkels Joshua I. Cohen sale, 12 November 1907, lot 122; collection of Adrian Joline; sold by Mary Benjamin to Allyn Kellogg Ford. Auction closed on Tuesday, May 29, 2012.